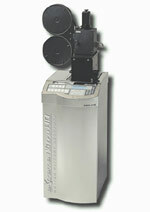 In 2007 Camex Vision has acquired the only CRT film recorder in Hungary. We guarantee the best price for both 2/4K. Calibration and service by Waizmann Engineering (Munich). Accepted image formats cineon, dpx, sgi or tiff. Naming convetions: name.00000.extension incrementing by 1's (e.g. : endcredits.00001.dpx and endcredit.00002.dpx etc.) Please supply your files on a hard drive formatted as NTFS, MAC OS-X or LINUX. Files also can be sent on DVD.